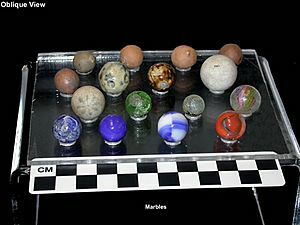 Marbles is a game played by children with small, round glass balls called 'marbles'. The balls vary in size. Usually they are about 1/2 inch to 1 inch (1.3 to 2.6 cm) in diameter, but they may range from less than 1/30 inch (0.111 cm) to over 3 inches (7.75 cm). 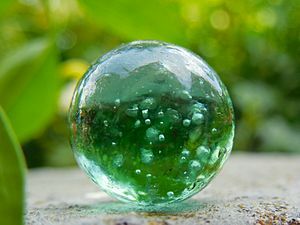 As the photographs show, the little glass balls can be most attractive, and they are often collected by children. In the North of England the objects and the game are sometimes called 'taws'. The games has been played in many countries, but the rules are made up by the players, and there are many variations. One standard idea is to have a target marble. Players flick their marbles with their thumbnail, and try to hit the target. Another version is where players try to hit each other's marbles out of a target zone. Marbles were found in the ancient civilisations of Mohenjo-daro, Ancient Egypt and Rome. Marbles has been played in Tinsley Green, West Sussex, England for many centuries: TIME magazine traces its origins to 1588. The British and World Marbles Championship have been held at Tinsley Green every year since 1932. The first championship in 1932 was won by a team from the Black Horse public house in nearby Charlwood. 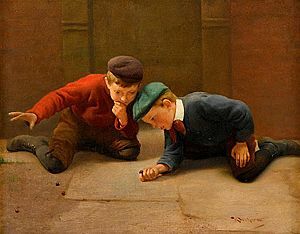 Traditionally, the marbles-playing season started on Ash Wednesday and lasted until midday on Good Friday: it was thought playing after that brought bad luck. More than 20 teams from around the world take part in the championship each Good Friday. German teams have been successful several times since 2000. Often, local teams from Crawley, Copthorne and other Sussex and Surrey villages also take part. 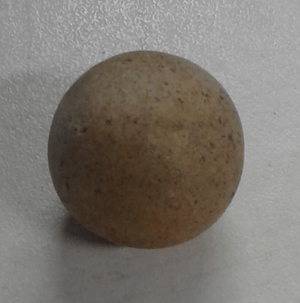 There are various types of marbles, and names vary from locality to locality. Ade - strands of opaque white and color, making lemon-ade, lime-ade, orange-ade, etc. Red devil's - same color scheme as a devil's eye but swirly. Clambroth - equally spaced opaque lines on a milk-white opaque base. Rare clams can have blue or black base glass. Medium-high value for antique marbles; rare base color valued much higher. Lutz - antique, handmade German swirl, containing bands of fine copper flakes that glitter like gold. Erroneously thought to have been invented by noted glassmaker Nicholas Lutz. Medium-high value for antique marbles, depending on specific sub-type of Lutz design. Onionskin - antique, handmade German swirl, with many closely packed surface streaks. Medium price range for antique marbles. Toothpaste - also known as plainsies in Canada. Wavy streaks usually with red, blue, black, white, orange. China - glazed porcelain, with various patterns similar to an alley marble. Geometric patterns have low value; flowers or other identifiable objects can command high prices. Commie or common - made of clay; natural color or monochrome coloration. Made in huge quantities during nineteenth and early twentieth centuries. Bennington - clay fired in a kiln with salt glaze—usually brown, often blue. Other colorations fairly scarce. Fairly low value. Crystal or clearie or purie - any clear colored glass - including "opals," "glimmers," "bloods," "rubies," etc. These can have any number of descriptive names such as "deep blue sea", "blue moon", "green ghost", "brass bottle". Indian - antique, handmade German marble; dark and opaque, usually black, with overlaid groups of color bands; usually white, and one or more other colors. Can also have many colors like blue, green and scarlet. Medium price range for antique marbles. Mica - antique, handmade German marble; glassy to translucent with streaks or patches of mica, ranging from clear to misty. Value depends on glass color. Steely - made of steel; a true steely (not just a bearing ball) was made from a flat piece of steel folded into a sphere and shows a cross where the corners all come together. Sulphide - antique, handmade German marble; large (3 to 8 cm [1.25 to 3 in] or more) clear glass sphere with a small statuette or figure inside. Most common are domesticated animals such as dogs, cats, cows, etc. ; then wild animals; human figures are scarce; inanimate objects such as a train or pocket watch are very rare and command high prices. The interior figures are made of white clay or kaolin, and appear a silvery color due to light refraction. A sulphide with a colored-glass sphere, or with a painted figure inside, is also very rare and brings a high price. Like other types of antique marbles, sulphides have been reproduced and faked in large quantities. Swirly - is a common marble made out of glass with one swirly color. Shooter- Any marble but in a bigger size. 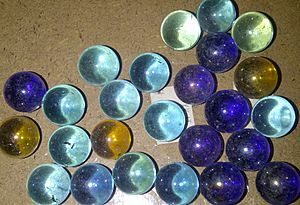 Marble players often grow to collect marbles after having outgrown the game. Marbles are categorized by many factors including condition, size, type, manufacturer/artisan, age, style, materials, scarcity, and the existence of original packaging (which is further rated in terms of condition). A marble's worth is primarily determined by type, size, condition and eye-appeal, coupled with the law of supply and demand. Ugly, but rare marbles may be valued as much as those of very fine quality. However, this is the exception, rather than the rule - "Condition is King" when it comes to marbles. Any surface damage (characterized by missing glass, such as chips or pits) typically cuts book value by 50% or more. Due to the large market, there are many related side businesses that have sprung up such as numerous books and guides, web sites dedicated to live auctions of marbles only, and collector conventions. Additionally, many glass artisans produce art marbles for the collectors' market only, with some selling for thousands of dollars. Marbles are made using many techniques. They can be categorized into two general types: hand-made and machine-made. Marbles were originally made by hand. Stone or ivory marbles can be fashioned by grinding. 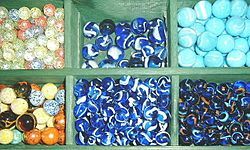 Clay, pottery, ceramic, or porcelain marbles can be made by rolling the material into a ball, and then letting dry, or firing, and then can be left natural, painted, or glazed. Clay marbles, also known as crock marbles or commies (common), are made of slightly porous clay, traditionally from local clay or leftover earthenware ("crockery"), rolled into balls, then glazed and fired at low heat, creating an opaque imperfect sphere that is frequently sold as the poor boy's "old timey" marble. Glass marbles can be fashioned through the production of glass rods which are stacked together to form the desired pattern, cutting the rod into marble-sized pieces using marble scissors, and rounding the still-malleable glass. 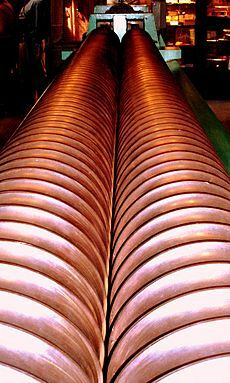 One mechanical technique is dropping globules of molten glass into a groove made by two interlocking parallel screws. As the screws rotate, the marble travels along them, gradually being shaped into a sphere as it cools. Color is added to the main batch glass and/or to additional glass streams that are combined with the main stream in a variety of ways. For example, in the "cat's-eye" style, colored glass veins are injected into a transparent main stream. Applying more expensive colored glass to the surface of cheaper transparent or white glass is also a common technique. Currently, the world's largest manufacturer of playing marbles is Vacor de Mexico. The company makes 90 percent of the world’s marbles. Over 12 million are produced daily. 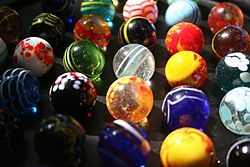 Marbles are also made in China and may contain lead, arsenic, and/or cadmium due to the manufacturing process of old glass. Marbles (game) Facts for Kids. Kiddle Encyclopedia.